Jane Goodall is arguably the world’s leading authority on chimpanzees. She has been studying them for almost sixty years as of this writing. Through the Jane Goodall Institute she continues her work of seeking to protect chimpanzees and their habitat, advocating globally for humane treatment of all animals, and mobilizing resources for conservation of the natural world. Reason for Hope, written in the late 1990s, is a memoir. As the subtitle indicates, it traces Goodall’s exploration of her own spirituality and her relationship with spiritual forces or entities. It does so by relating events in her life and career to spiritual principles or concepts. She ends many chapters, early chapters in particular, with a reflection on a spiritual concept that arises in the narrative of that chapter. She uses the word “God” to describe a universal spiritual force or entity, but her theology draws from many spiritual traditions, and is not limited to a monotheistic or trinitarian understanding of God. Jane Goodall was raised in the Anglican tradition, which gives her some of the language she uses to describe her spiritual experiences. She experiences awe, for example, in natural settings both in her homeland of England and in her adopted homes in East Africa. That awe leads her to conclude that a force either outside of or permeating the natural world is responsible for the wonders and beauties one sees in that world. Early in the narrative, on pages 50–51, Goodall argues that science and faith are not incompatible. Through her relationship with Louis Leakey she was schooled in the principles of human evolution. Honoring her Anglican upbringing, she concludes that God set humans apart at a certain point in evolution by sending the Holy Ghost on them. In spite of this special relationship with God, humans are prone to great evil. Having lived in England through Second World War, Goodall has seen that evil at close range. She also describes a visit to Auschwitz and visits to laboratories where primates and other creatures lived in unbelievably cruel conditions. She cites further stories she has read or heard that demonstrate human beings’ cruelty to fellow humans. Finally, she cites example after example of humanity’s despoiling of the natural world. Despite humans’ seeming inability to act responsibly toward one another or toward the natural world, Jane Goodall sees human intelligence and ingenuity as reasons for hope. She sees the natural world as being highly resilient. As do many who hold out hope for humanity and the environment, she also sees the passions, energy, and idealism of young people as providing the greatest source of hope. It has been over twenty years since the writing of Reason for Hope. Is Jane Goodall still optimistic about humanity’s chances for reversing some of the evils we have inflicted on the natural world? The publication of Seeds of Hope: Wisdom and Wonder from the World of Plants in 2013 would seem to suggest that she is still optimistic. I hope that’s true. If reading more books is one of your goals for 2019, consider adding The Nature Fix to the list of books that will be part of that goal. Read it early in the year, because it may affect your other goals and pursuits for the year. At just under 260 pages, it could easily be read in one snowbound day. A blurb on the back cover calls Florence Williams a deft writer, and it would be hard to improve on that description. Williams is a journalist and a contributing editor to Outside magazine. Her writing has also appeared in the New York Times and National Geographic. The Nature Fix is all about how increasing our exposure to the natural world, even by small amounts, benefits us physically, intellectually, and emotionally. Florence Williams describes these benefits through engaging accounts of her investigations of scientific experiments and social and educational programs. These experiments and programs attempt to measure the benefits and apply them to specific populations. The populations include city dwellers in Japan and South Korea, military veteran women who are suffering from PTSD, and teenagers whose ADHD puts them at a severe disadvantage in a traditional classroom. An especially good chapter is chapter 3, entitled “The Smell of Survival,” which discusses so-called healing forests, and the programs that make use of them, in South Korea. Quoting Park Hyun-Soo, who Williams says is “more of a ranger-slash-shaman,” Williams writes “‘The soil is also good for healing. It is antiviral and the geosmin is good for cancer.’ Geosmin, I learned, causes the funky-great smell of earth after a rain.” Looking back at some recent books on soil, Courtney White’s Grass, Soil, and Hope and Ragan Sutterfield’s Cultivating Reality, it looks like the soil can help us in many ways, including some that are much less obvious. Who would benefit from reading The Nature Fix? Parents and grandparents, educators, health-care professionals, counselors and other mental-health professionals, city planners, retirees and soon-to-be retirees, and just about any other persons who are themselves stressed by urban or suburban life or who want to help people in that situation. During a recent visit to Chicago my son Andrew and his wife Jodi stopped by the Field Museum. There they purchased a copy of The Peregrine Returns: The Art and Architecture of Urban Rapture Recovery, written by Mary Hennen and illustrated by Peggy Macnamara. They gave it to me for Christmas. I wish I had a coffee table. I would leave the book there indefinitely. The Peregrine Returns is an informative, charming, and encouraging book. The writing is spare and clear. If the writer had been a journalist or other professional writer the text could easily have become florid. Instead, Mary Hennen is a scientist employed by the Field Museum, and her concise prose exhibits an unforced affection both for the Peregrine falcon and for Chicago. The “Artist Notes,” written by Peggy Macnamara, are brief lessons on the techniques used in rendering the illustrations. Each of the watercolor illustrations is itself a lesson, as the artist has included lines, circles, arcs, and other geometric features in the paintings to demonstrate some of the techniques used to establish perspective, proportion, and balance. Attempting to further describe features of the illustrations, such as the clever enlargement of details, would not do them justice. At least one online bookseller includes some illustrations in its preview of the contents and it is worth scrolling through the pages to see some of the beautiful paintings. A painted lady (Vanessa cardui) stopped and visited our coneflower (echinacea purpurea) today. This butterfly visited as fall was arriving in the northern hemisphere. Like its more well-known cousin the monarch, the painted lady doesn’t stick around for winter. It gets out of winter’s way and heads toward a warmer locale. Some butterflies, such as the mourning cloak, can winter over in the temperate zone. That’s why mourning cloaks are among the first butterflies to be sighted in the spring. Sometimes we can see changes or events coming and we can prepare for them or get out of their way. In the past few weeks millions of people saw storms coming and got out of way or prepared to weather the storms. In spite of their preparations, many people suffered great personal harm from the storms. In Mexico many thousands of people had no way of knowing that earthquakes were coming and also suffered great personal harm. If you are like me, you do not have the skills to help the survivors rebuild their lives. But we can give, and we can pray. Please do both as you think about creatures who are preparing now for the coming of winter. When we arrived the tide was in, so few wading birds aside from great egrets were visible. Soon after we arrived we met two photographers whose camera lenses were longer than my forearm. One of them graciously directed our view to a nearby opening in the phragmites at the water line and said that there were several least bitterns hiding there. I caught a quick glimpse of the head of one and another flew past moments later. A great egret at De Korte Park. We were then treated to a display by a Forster’s tern. He hovered briefly a few yards above the water, then dove in, presumably in hopes of catching a fish. I wasn’t able to photograph the acrobatics, but I did manage to photograph him while he was resting on a metal railing. Please excuse the quality of the photographs. At maximum optical zoom my camera lens is the 35-mm equivalent of about 70 mm in focal length. A Forster’s tern. Notice the comma-shaped eye- and ear-band. We heard but did not see several other small birds hiding in the phragmites. Two pairs of medium- to large-size wading birds (dowitchers?) flew by while we were watching the tern. We also got to see several swans, an American black duck, several goldfinches, a ruby-throated hummingbird that was being harassed by a small brown bird that we could not identify, and a couple of turtles. The walkways and other fixtures in DeKorte Park were heavily damaged in 2012 by Superstorm Sandy. They have since been repaired or replaced and, in some cases, enhanced. Sadly, invasive phragmites have replaced much of the native flora and this undoubtedly affects the well-being of the wildlife that makes its home in the park or passes through on its migratory journey. The park staff work to keep key viewing areas clear so that folks like us can spot birds and other creatures. The Environmental Center also has an observatory that is open to the public on Wednesday evenings from 8:00 p.m. until 10:30 p.m., weather permitting. We went one Wednesday evening in 2016 and saw Saturn, rings clearly visible, through the telescope. DeKorte Park is adjacent to the offices of the Meadowlands Environmental Center and the New Jersey Sports and Exhibition Authority. It’s located at the southeastern end of Valley Brook Avenue in Lyndhurst, NJ. Valley Brook Avenue turns to the right and becomes Disposal Road just before the park entrance. The name “Disposal Road” is fitting because the offices and park are located at the southeastern edge of a large landfill that is now closed. In our less enlightened past we viewed the Meadowlands region as someplace to dump our garbage. Thankfully our governments and businesses now recognize that wetlands such as the New Jersey Meadowlands need to be preserved and protected. It’s worth a visit to understand why. Also, check out this interesting article on how wetlands mitigate damage from severe storms such as Superstorm Sandy. Just before sunrise, at approximately 7:15 a.m. on New Year’s Day, our neighborhood in the Allwood section of Clifton was very quiet. No surprise, really, given the day and time. The sounds that could be heard were mostly bird calls, including jays, crows, English sparrows, and a nuthatch. A grey silhouette, shaped like a mockingbird, sat in a nearby bush but made no sound. The birds that remain in the area during the cold months are active and vocal. They call to alert one another to the presence of predators or to the location of food sources. In a few weeks they will begin calling to attract mates and any quiet early mornings will be filled with those hopeful sounds. By coincidence our pastor at Grace Presbyterian Church, Paul Leggett, preached on New Year’s Day about the sometimes unrecognized presence of Christ in our midst. In discussing John 1:26b Paul said that anything that brings us joy, such as hearing bird calls, is a token of the presence of Christ. By another coincidence Krista Tippett’s On Being broadcast on New Year’s Day 2017 featured her interview with Gordon Hempton, originally aired in May 2012. Hempton refers to quiet not as the absence of sound but as the absence of noise. Big difference. He also says that humans have evolved to be most sensitive to sounds in the frequency range of bird song. This suggests to him that one of the key indicators of a habitat or ecosystem that will support human life is the presence of bird song. As Ecclesiastes 3:7 tells us, there is a time to keep silent and a time to speak. Many of us think now is the time to speak, if social media activity is any measure of those inclinations. Yet few of us are truly the prophets whose voices need to be heard. (Yes, I do grasp the irony and hypocrisy of that statement.) Bill McKibben is a prophet. Wendell Berry is a prophet. Tim Keller is a prophet. [insert name of your choice here] is a prophet. I am not. I need mostly to listen, evaluate and think critically, and, because being silent does not mean being passive, act in ways that will benefit humanity, the planet, and the church. For my part I hope 2017 will be more a time for keeping silent and for being thoughtful, intentional, and charitable when speaking is necessary. I wish for you a year filled with beneficial silences, profitable interactions with those around you, and actions that bear good fruit. May contentment and health also be yours in abundance. Thank you as always for stopping by. On a recent Saturday morning the air was cold and the sky was clear for the walk to the bakery. Blue jays and cardinals called in the distance but I did not stop to look for them. Other birds might have been calling but I paid them no attention. It was impossible not to pay attention to the crows, however. There were dozens of them in the trees and on the utility lines; here and there a few hopped around on the ground. The Bergen County Audubon Society advocates for smarter gardens. A pair of bald eagles, residents of Ridgefield Park, are given some space by a local developer. A third article about Ivan Kossak of Lincoln Park, a birder and an environmental activist, appeared in the print edition but is not available on line. It’s great to see the local news media giving such extensive coverage to local wildlife. Enjoy! And thanks as always for stopping by. Greetings. I hope this finds you well. This is just to share two stories about birds published recently. New York news outlets have been carrying stories about a painted bunting that has been seen in Brooklyn. This bird would ordinarily be in Florida or Mexico at this time of year, yet here it is in Brooklyn. Why? Who knows? Meanwhile, the November 26 issue of The Behemoth carried this story about bird memory. Unlike the painted bunting, the black-capped chickadee is a common year-’round resident. If a New Jersey homeowner puts out a bird feeder, there’s a good chance that chickadees will find it. The notion that chickadees and other birds have such remarkable memories brought to mind a post from two years ago on squirrels and how they find their stashes of food. With no leaves on the trees, the late fall and winter represent a great time to observe birds and other wildlife in our neighborhoods. In New Jersey we will see an assortment of birds, including chickadees but probably not including painted buntings, throughout the winter. It’s worth enduring a few moments of cold to enjoy their presence. This past weekend our granddaughter E__ and her Mom came for a visit. 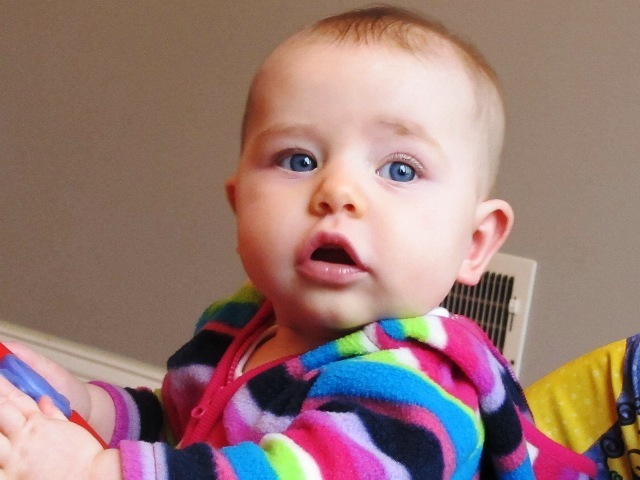 Yes, it is pretty shameless to exploit an adorable infant to draw readers to this blog. We had planned on Saturday to take her for a walk and introduce her to the local park and library. The weather proved contrary, so we stayed in. When E__ took a nap, Mom and Grandma left briefly to run errands, thinking that the nap would last until they returned. Within minutes she was awake and calling out, although not crying. I can’t say that I was displeased to have a few minutes alone with her. She is good company and rewards attention with good cheer. At that moment she preferred being up and wandering about, and I was happy to oblige. We found ourselves looking out at the rain through the sliding glass doors. As we stood there, E__ looked back and forth at the houses and trees surrounding our backyard. I hoped for a rabbit sighting but the rabbit did not oblige. Soon a crow passed over the yard and it caught E__’s attention. She followed the bird until it flew out of sight. When you are five months old everything is new, and the objects that older children and adults find commonplace can be fascinating to you. We see and hear crows by the dozens every day, and aside from learning recently that crows will sometimes bring gifts to people who feed them, they hold little fascination for us. That may be short sighted. I would wish for E__ that she would always be fascinated by the world around her, especially the natural world. As it happens, the sermon at Grace Presbyterian Church this past Sunday was about children. The faith of a child—eager, imaginative, and uncomplicated—is a model to which people at all stages of life can aspire. It was not an accident that I was struck with a small sense of joy and wonder when I heard a nuthatch, saw a sharp-shinned hawk, and saw and heard killdeer on a brief walk to another nearby park today. Spring arrives this Friday, 20th March 2015. The weather for the coming weekend promises to be suitable for spending time outdoors. I hope you get at least a few minutes to watch the crows, see whose crocuses and daffodils have emerged, or look for Venus, Mars, or even Uranus in the evening sky.